When I learned how to make Mexican breakfast bread recipes, I found the most popular is the corn tortilla. It is as common to the Mexican breakfast as bread or toast is here in the United States. They are used to fold up eggs, chorizo sausage, ham, bacon, cheese or whatever is available to make breakfast tacos and burritos. Breakfast tostados (like our open face sandwich) made with corn tortillas are also popular. Corn tortillas date back ten thousand years and they are easy to make with unleavened dough. I also learned how to make Mexican breakfast bread recipes including many sweet breads. As in most countries these breads are a welcome sight to the breakfast table. Not only are they delicious but can conveniently be made ahead of time. They are handy for people on the go to grab and eat on the way. They are often laden with nuts and other delectable fruits. As I learned how to make Mexican breakfast bread recipes, I found many to include fried dough. Who doesn’t love fried dough? Along the line of what we call donuts (also spelled doughnuts) here in the United States, are the churros and sopapillas in Mexico. Both are equally delicious! The churros, a quick bread, are piped onto a tray from a pastry bag. A slight freezing makes them easy to drop in hot oil to fry. 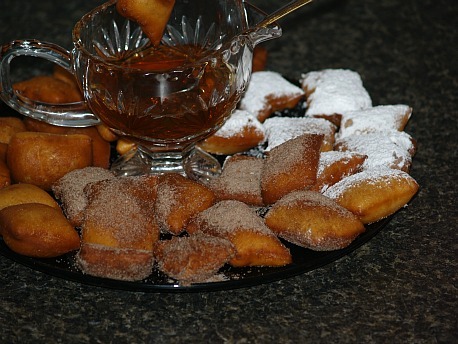 The sopapillas are made with yeast dough, rolled cut in squares and then deep fried. Choosing between these two recipes is like us choosing between cake and yeast donuts. This Mexican bread recipe for sopapillas is a delicious fried dough. Heat 2 to 3 inches oil in a heavy pan to 375F degrees. Mix all the ingredients except for the powdered sugar or honey, beating until a soft dough forms. Turn dough onto a floured board. Shade into a ball and knead several times. Roll dough into a 10 inch square. With a flour dipped knife cut 2 inch squares. Fry in hot oil until golden brown on both sides. Drain on paper towels. Dust with powdered or dip in honey. Mix Bisquick, sugar, and the cold water until soft dough forms. Beat vigorously 30 seconds. Turn onto a floured board rolling gently to coat. Shape into a ball and knead 10 times. Divide dough into 6 equal parts and shape each into a round ball. Roll each out into a circle. For the filling mix together the brown sugar, nuts and cinnamon until well blended. Spread each of the dough circles with soft butter and scoop 1/6 of the filling in the center of each dough circle. Fold dough over in half and press lightly down. Mix egg yolk and 1 tablespoon of water; brush over each sweet bread. Bake 10 to 12 minutes or until golden brown. Remove from the oven and cool slightly. Drizzle with glaze and serve warm. Combine the sugar, butter and vanilla and mix. Add the milk, one teaspoonful at a time while mixing to get right consistency for drizzling. This is an essential Mexican breakfast bread recipe. Combine and mix the ingredients into soft dough; divide into small egg size balls. Roll each ball out between two sheets of wax paper; thin about 5 inch rounds. Place on ungreased griddle; about 2 minutes on each side until edges are slightly browned. Wring dish towel out in hot water and lay out. As tortillas are cooked wrap in paper towels and stack on wet towel. Wrap wet towel around stack of tortillas; wrap towel and stack in aluminum foil. They can be kept in warm oven AT 150F DEGREES for up to an hour. Skin chorizos sausages and chop coarsely; sauté in a little oil with a little chopped onion. Remove sausage and onion from pan to platter; drain oil out of the pan. Combine and mix several eggs (depending on how many you are feeding). Put eggs in skillet with a little melted butter and cook until almost done. Add sausage and onion mixture and blend; add a chopped tomato. Top mixture with shredded sharp Cheddar cheese; turn heat off, cover and let cheese melt. Set skillet on hot pad and serve from skillet; serve with warm tortillas, hot sauce and sour cream.